The plugin loads 5 rows when scrolling to the end of the page until photos all are loaded. If the configuration specifies more than one page, then it calls and loads next page until it reaches maximum pages. The current solution is not perfect and may affect the performance when it loads more than 800 photos. I will be working on optimising the performance to allow loading more photos. This jQuery plugin also uses Colorbox to show larger version of photos when user clicks on the photo. Okay, let me explain the configuration and how to use the plugin. However feel free to jump straight to the demo to view-source. 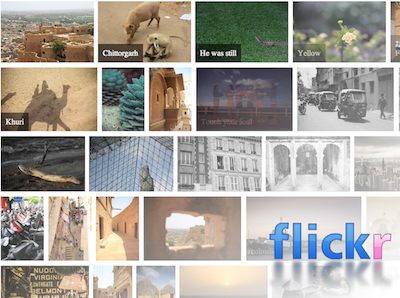 The following example uses "flickr.photos.search" method to load photos with tag "canon". It shuffles loaded photos to randomly display photos. If you want to display your photo stream, you should add "user_id" to params and change the method to "flickr.people.getPhotos". You can see it in action at below or from here. You can also read and study the plugin from here. Well, if you enjoy this article, please leave a like or a plus and let me know your thoughts in the comments. Any way of showing the large photos (_b or _l) in the lightbox? I have updated the code which allows you to specify the image url for colorbox (note the line 22 [cb_url] and 29 [extras] in the article). You just need to replace the plugin file and add the extra two parameters to the configuration. You are welcome, mate. I am glad that it could be useful for you. The default setting is only showing 5 rows therefore your smartphone may shows less on your screen. Have you tried landscape mode on your mobile? It will allow you to scroll and show more photos. Hi. Came across this error: http://screencast.com/t/hZlTsOGyLhNl any suggestions on how I can fix this?